Americans’ acceptance of evolution: does it depend on how you ask them? 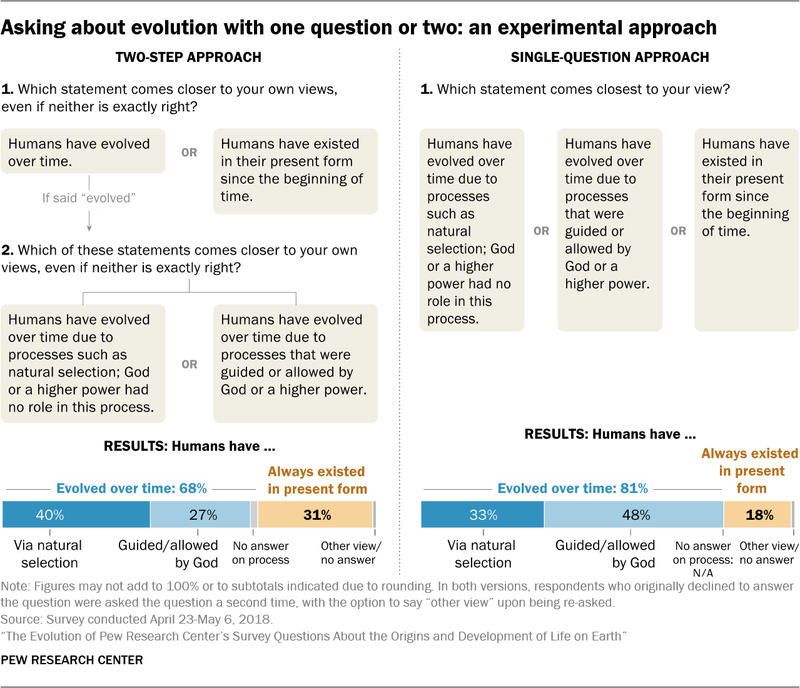 Pew used to ask the evolution question in a two-step process. First, they asked if people thought humans had evolved over time or had existed in their present form since the beginning of time. Then, if they answered that humans had evolved, they asked those people whether they thought humans had evolved through natural, unguided, un-divine processes, or through processes guided or allowed by God. As you see, if you give people three alternatives at once, pure creationism falls from 31% to 18%, theistic (guided) evolution rises from 27% to 48%, and, surprisingly, unguided, natural evolution falls from 40% to 33%. Somehow Pew sees this as good news, though I don’t: if you lump those who see God directing evolution (a watered down form of creationism, like Behe’s) with de novo creationists, the total of non-“naturalists” under the new protocol is 66%, while it was 58% before. And there are 7% fewer people who accept naturalistic evolution under the new protocol. But Pew, like many accommodationists, likes to see theistic evolutionists, for although they see God’s working in the process, at least they accept evolution. I’m not so charitable! Naturalism is naturalism, and what we see now are fewer naturalists than we thought. That’s not good news. The results of the new experiment indicate that there are some people who do believe that humans have evolved over time, but who, for whatever reason, did not say so in our traditional method of asking about the topic. Perhaps without the opportunity to immediately connect evolution to God, some religious respondents may be concerned that expressing belief in evolution places them uncomfortably on the secular side of a cultural divide. That purports to explain the reduced proportion of pure de novo creationists, but does that really explain the increase in number of theistic evolutionists—those who think that evolution occurred but God had a hand in it? After all, are those people not still expressing faith in God? I have no explanation for these discrepancies, since the questions are virtually identical. There is other interesting stuff, too, but I have work to do and will probably post on it in the next few days. But I wanted to put up one more figure from the Pew survey, which shows that religion poisons everything and that atheists are, as expected, the most avid acceptors of pure, naturalistic evolution. We don’t even like Theistic evolution! Also, women, as expected, are more keen on creationism, as women are more religious than men. And, as always, older people are less accepting of naturalistic evolution, as are the less educated. The age effect may be due largely to younger people being less religious. If the data below show anything, it’s that religion impedes acceptance of evolution. But we’ve known that for a long time, though organizations like the National Center for Science Education don’t like to admit it. After all, it shows that religion poisons the mind. This entry was written by whyevolutionistrue and posted on February 15, 2019 at 1:19 pm and filed under creationism, evolution, science education. Bookmark the permalink. Follow any comments here with the RSS feed for this post. Both comments and trackbacks are currently closed. Who are these atheists who don’t ‘believe’ in evolution? Maybe people who watch Alien shows on the ‘History’ channel? Personally I like to ask people if they agree that humans and chimps share a common ancestor and more recently than chimps and gorillas. Kind of sums up a lot into a simple question. Many people who agree to that are nonetheless surprised that chimps and bonobos share an even more recent common ancestor. I’ve learned that a proportion of self-identified ‘atheists’ have a rather narrow understanding of God, limiting the term to the Abrahamic God of the Bible and Quran, full stop. That means all other Higher Powers and supernatural forces don’t count as “God” for them … but probably would for most naturalist atheists. Several long and thoughtful discussions might persuade these “atheists” to recategorize themselves as “theists.” Or they might not. I can’t help but think evolution with a helping hand is a step in the direction atheists would desire. Not far enough for sure. It is a step in the right direction and, who knows, it may lead to more steps. If you accept the principle of evolution, even with mistaken view that God nudges it, you may want to learn more, and perhaps even read WEIT and eventually learn that God’s help is not needed. It would be completely awesome if god in any form really existed. I think like anyone, atheists would delight in being in such a universe. A god who is concealed but tweaks causality would be a fascinating thing to ferret out and study. A god who intervenes, bending the fate of good and evil would be highly desirable. No Hitler, for example. A god who rewards the good with an eternity in paradise would seem a gift beyond measure. It’s just that we don’t think there is any such god. Awesome: very impressive or even frightening. You have to do more than just consider what it would be like to have a god looking after you and ensuring everything turns out for the best. Clearly that’s not the case on this planet. What if the being in question is more or less evil or capricious? The universe as we find it comes much closer to supporting these as some of the characteristics of any supreme being running this neighbourhood. Be careful what you wish for. You might not actually enjoy a life where someone was constantly tinkering with you and everyone you met. I find the “helping hand” idea the oddest one, myself. I don’t see how someone reconciles the idea of there being a god, but all the god does is nudge evolution around a bit. I wonder if they should add another option, saying you think there is a god, but not one that affects evolution. Some people might be picking the theistic evolution option just to register that they are believers, not atheists. I agree. I don’t understand why Prof. Coyne puts theistic evolution in the same category as the clearly creationistic views of Behe. Religious people (at least those I know about) don’t think of their God as idly sitting but of somehow “directing” the world. However, most of them now do not think of God as overtly interfering into the world affairs and doing things that would not happen naturally (actually, this is called “miracle” and is considered vanishingly rare). A religious person will say that “God directs his life” and nevertheless do and analyze every single thing in his life as an atheist would. So I don’t expect the same person to say that God does not direct evolution. I don’t understand why Prof. Coyne puts theistic evolution in the same category as the clearly creationistic views of Behe. Because Behe isn’t a young-Earther or old-Earth creationist. He believes evolution happened, just that there are moments when his god came down and tinkered with biology. And I agree with PCC(E) on this one. If one believes in guided evolution, then it’s not evolution through natural selection (plus whatever new stuff we’ve found out). I know many Christians who believe in theistic evolution through natural selection. The proper name for such a group would be deist rather than theist. Theism has one or more magic beings interfering with natural processes, while deism has the same being(s) setting up the initial conditions and then not fiddling around with the ongoing results. I appears as though you do not know what “theism” actually means. The proper name for such a group would be deist rather than theist. The former has some alleged supernatural critter(s) creating the original conditions for the universe and then letting natural processes proceed without any intervention. In contrast the latter has the same alleged supernatural critter(s) fiddling around with the natural processes well after the initial conditions. Of course there is no evidence for anything supernatural but that does not stop true believers since they base everything on an unshakable conviction. OK, but “deistic evolution” is never included as a category (at least I have never seen it). I know quite a few athists who support Trump or at least have voted for him and consider doing it again. You need not be a creationist to be against illegal immigration. I suspect that like that nonsensical 2% you do not know what “atheist” actually means. Perhaps you could point out that group which is in favor of *illegal* immigration for us. Trump has defined *illegal* as being anyone who is not “white” trying to gain entry into the US through the southern border, even if it is to escape terrorism in their home land. By closing the borders to anyone seeking asylum and blocking all attempts to apply for asylum anyone trying to enter the US for those reasons becomes *illegal*. Personal attacks do not bring an argument anywhere, unless you have power over the person you are attacking, which is not the case. Many leftists are in favor of illegal immigration. You are also in favor of it: you even put it in scare quotes. Perhaps you could poiint out those which jump the US border “to excape terrorism in their home land” (though even your comment fails to explain why the people in question do not escape terrorism in Mexico). So this child, like Aylan Kurdi in the Aegean 4 years ago, fell victim to his father’s wish to get into the First World at any risk. As for white vs. non-white illegal immigrants, I know white illegal immigrants (some of them my compatriots) with various outcomes; recently, an Albanian mother of 3 was deported. But the narrative about illegal immigration is distorted by the tendency of its supporters to feel alienated from white people, even when they are white themselves, so it is all about the nonwhite immigrants. Whoa! 2% of atheists believe a supreme being guided evolution? Who are these people. I was going to ask that too. It would seem to be an impossibility. I’m intrigued by the relatively high percentage of Buddhists and Hindus who believe in evolution (better than anyone except atheist/agnostic). It just means that at least 2% of the population is hopelessly confused. If you give anyone a 10 or 15 year head start to brainwash you, especially during those years when you are likely to accept anything, the game of teaching something different is much harder to impossible. In fact I believe it is much easier, more natural for a life- long atheist to accept science than a late bloomer. Probably get some grief over this last statement. Let us turn the experiment around and teach evolution and other science for 10 years and then attempt to introduce religion. I’ve yet to see the explanation of how one would go about ‘making humans in their present form’. What’s the technique? In some metaphysical vat? Ingredients? Is there a cookbook available? It sounds like magic and much too complicated. Down here on earth we just simply use a woman and a man, time (+ some romantic music?). As determined by evolution. Unless you’re following the recipe in Genesis 2. A classic about opinion polls. Wow – ahead of its time, that one? How I miss Sir Humphrey! The last graph gives me hope for the future. The younger you are, the more likely you’ll accept evolution sans supernatural help. This correlates with the young being far more atheist/agnostic than the older population. No surprise that the Evangelicals, Mormons and Jehovah’s Witnesses are the most blinkered…or poisoned. All UK online grocery shopping sites throw multiple choice e-surveys at their customers in exchange for loyalty points or entry into a big prize raffle. The object is to see how existing customers can be persuaded to move more of their shopping to the questioner’s operation over the fierce competition. The rewards are not worth the 15 minutes to fill em in, but I did one before I realised that & I noticed there’s an awful lot of consistency check questions that cross reference answers given earlier. I conclude that the shops know that many people sleepwalk through this kind of thing & are careless about accuracy. Pew don’t just ask the triple question, they first want to know a whole load of info about ones circumstances. It’s boring & people resent it a little so they confabulate – plenty of people can’t possibly keep a triple multiple choice in their head all at once so there’s going to be absurdities. Also the average literacy comprehension is around the pre-teen level in the western world & those questions are far, far too complex – especially if a phone survey! I notice JW’s are the most brainwashed – Not surprising at all. Yeah weird people – and the ones I’ve met [around a dozen] are stunningly ignorant – clueless & incurious about the world. There are atheists, or people who call themselves atheists (they can be intellectuals, but are somewhat of a mystic inclination), who reject the gods existing in the current religions, but accept some kind of intelligent superpower, who (or that) is not connected to the existing religions, who (or that) somehow organizes things, such as evolution, and the emergence of intelligence. Don’t worry, I don’t subscribe to this idea. Can you suggest a concrete example? It seems to describe the Raelians, though there aren’t enough of them to show up other than in the noise on such an opinion poll. Another factor that may be at work is that, if you give people a choice of three positions on a continuum, a greater proportion will pick the middle one because it seems safest — not too extreme in either direction, hedging one’s bets, not wanting to seem too committed to an idea that someone might then require you to defend or explain (they don’t know what follow-up questions there might be). That this is the psychology at work is also shown by the fact that the middle proposition, in this example, has managed to garner extra votes from *both* atheists and creationists indifferently. If it were truly about the content of the propositions, the additional votes option 2 gets would be heavily at the expense of one of the other positions while leaving the third little changed. For that reason, the two-part question format is, to my mind, more likely to lead to a truthful answer. It would be interesting to conduct surveys that, in addition, split a variety of secular questions in the same way to see if the same kind of shift across all responses. This. It’s a classic case of social desirability bias. And in the age of Trump, I’m feeling like any impulse toward moderation is probably a good thing. But when faced with an opportunity to choose between three options, the middle one looks right to most people. Sometimes it looks right even if they’re not in order. I have noticed that the Templeton- friendly are very fond of equating atheists with fundamentalists, leaving their moderate selves in the golden middle. A survey that reflects their values is going to be appealing. Recently I was at a public presentation at a nature center. The presenter was a woman with the federal Fish and Wildlife Service. At one point she described adaptation and was unable, it seems, to mention the word evolution. She bent her language around awkwardly saying, change over time, etc. I was astonished, to say the least. I strongly suspect the word has come from Trump appointees down to the grass roots that creationism must be accommodated. I note that the Gallup is a religious (formulated) question, while the Pew question clearly puts science (including a key word) as one alternative.